I believe that everyone who lives on the North American continent shares the heritage of the Native Americans. They left a legacy that they created over thousands of years, and it is ours to learn and enjoy. In 1998, I learned how Native Americans created beautiful art with glass beads, both on a loom and directly on leather. In 2004, in the Upper Peninsula of Michigan, I learned how the Chippewa created many useful things from birch bark. ​One year, I attended a pow-wow at Atwood Lake in Ohio and asked a Native American to explain an item she was selling. She explained that it was a directional choker. She said, “When you educate people about our culture, tell them about the four colors.” These colors appear on many of my artifacts. In 2004, I visited a craft show in Grand Haven, Michigan. I asked a Native American vendor to play something for me on a rather crude flute he was selling. He made it sing. I couldn’t get a note out of it. I bought it and learned to play a little more. Eventually, I graduated to more challenging instruments and now incorporate my flute music in my practice. In 2008, the Cleveland Metroparks asked me to construct a wickiup for the maple sugar festival that occurs every winter. I learned how to do this using black willow saplings for the frame and common reeds for mats to cover the structure. I had to rebuild the wickiup every year because it would lose its shape. 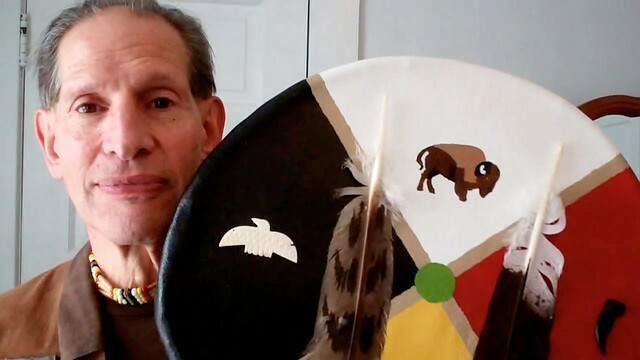 I’ve developed the art of telling Native American stories. As I travel around the country, I keep an eye out for Native American legends that I think people, especially, children, will enjoy. I involve my audiences in my interpretive practice with singing, dancing, sign language, discussion, and shooting my primitive bows and arrows.